The Magical Leading Ladies Of WICKED, Carly Anderson (right) and Jacqueline Hughes (left). 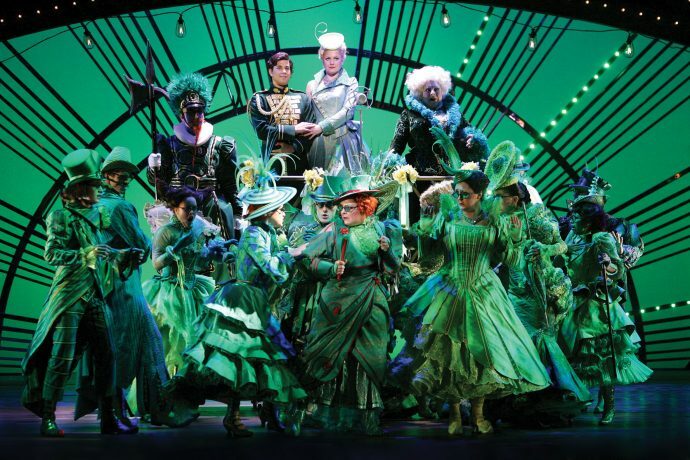 For those who have not seen Wicked, could you give us a quick introduction to the show? J: Wicked is based on the novel by Gregory Maguire. It is the untold story of the witches of Oz; Elphaba (Wicked Witch of the West) and Glinda (the Good Witch). It follows them as they go on an incredible journey of friendship, discovery, acceptance and bringing our audiences into the Wonderful World of Oz. C: It’s the re-imagining of the Wizard of Oz and a re-examination of good and evil. It looks into why the people of Oz decided one was good, and one was wicked. And, a little more on your characters? J: So, Elphaba is the iconic witch with her emerald green skin. She’s misunderstood. But, she is really true to herself in her beliefs and, ultimately, fights for everything she believes in. Sure doesn’t sound like a wicked witch. J: That’s the thing. She’s branded but she’s always trying to do right! Both characters are, actually. C: That’s one of the themes we touch on; good intentions with bad outcomes, bad intentions with bad outcomes. What about Glinda the “Good Witch”? J: Like, okay. Let’s start something with it! C: She’s always been good. But, it is through overcoming her ambitions where she realises that, you can have everything – all the money and power – in the world, but it might not make you happy. It is really about love, friendship and having the people she cares surround her. And, this all happens while they are still in school? J: Yes, but they don’t have the best start together. C: They have opposing personalities, and a bit of rivalry throughout the show as well thanks to a certain love interest! How does it feel to be presenting these iconic characters – deconstructed? J: It is sort of the pre-Wizard of Oz; a tilt of how these characters are perceived. C: When you go back and watch the film now, when you see Glinda arrive in her bubble and Dorothy to Oz, you’ll realise that there’s really much more going on to the story than meets the eye. 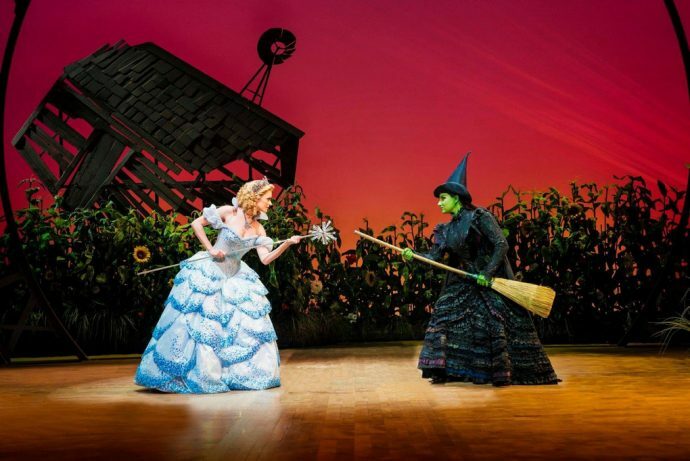 There’s always two sides to the story – and that’s what Wicked explores! Everything isn’t always as it seems. We know Elphaba is a “good” character in Wicked, but, she remains in many of our childhood memories as the iconic baddie. How does it feel to take on this role? J: It is wonderful! I didn’t ever see her as a “baddie” (while it is cool to think of it that way). There is so much that I get out of the character, and so much more I discover about her as I play through different shows. When she does eventually become a “baddie”, it is one of my favourite points in the show. That is when I sing the song “No Good Deed”. It happens halfway through Act II, acting as her turning point where she succumbs to her “wickedness” (so as to speak). She says, “Okay, you know, you’ve all called me wicked, so here I am!” It is her peak. It is dark, thrilling and the music is exciting. 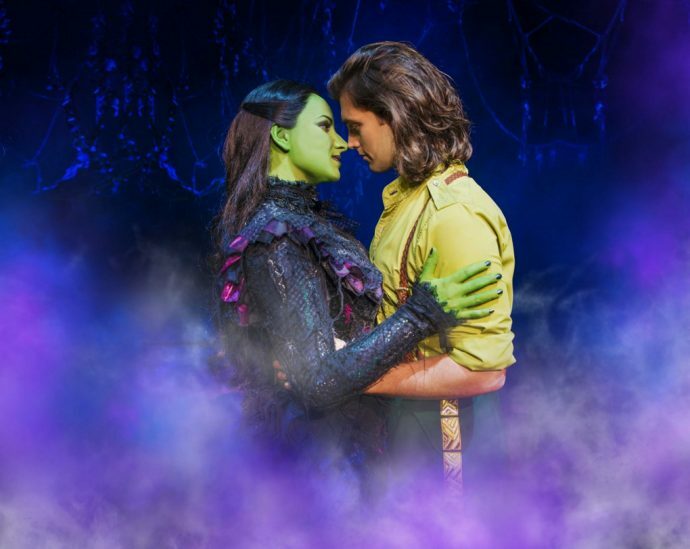 What was it like seeing yourself all green and dressed up as Elphaba? J: I was thinking to myself, “Oh my goodness! I look much better green!” Everyone should wear green. It really makes your eyes pop! Glinda has a lot of comedic moments in the show! What’s it like playing a funny and lighthearted character? C: I actually much prefer them. The thing about comedy is that it is not actually trying to be funny. 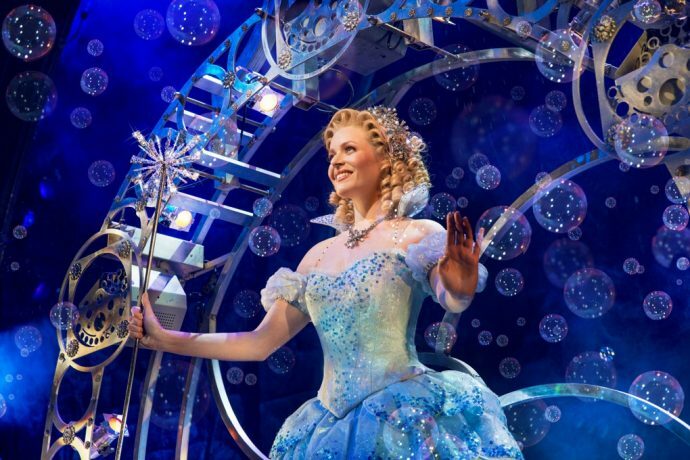 It is playing on the honesty and the truth of the moment – something Glinda has in abundance. It is what makes her funny, and it is those moments that get laughs. She is a wonderful character to play. Blonde, popular girl, but deep down she has serious flaws; something everyone can relate to. Glinda’s costumes are just as crazy! How does it feel to be dressed up in these extravagant costumes all the time? C: Every single show is out of this world! The care, attention and details that have gone into them are second to none. Susan Hilferty (costume designer) has an incredible eye. The dresses I wear (as Elphaba) are made from such luxurious materials. J: And, Glinda has the dream wardrobe. Barbie would be so jealous! Her iconic bubble dress was painstakingly made – it has 33 individual petals, all hand sewn. The whole dress weights about 10 Kg. It is quite a hefty thing to swing around every night! What do you think is about the show that makes it so popular with audiences? J: The show and the characters; they are all something the audiences can relate to. Yes, it a huge spectacle with the lavish costumes, music, but, at the heart of it, it’s incredibly tender and full of heart. It is led by two female characters, which is very rare for musical theaters. They are both opposing in personalities and background, so, when they actually become friends, they help and accept each other. And, I think this is what our audiences really relate to – the friendship. C: There’s no other show really like it. J: It just works! It’s got everything you ever wish for in a musical. J: Probably in Act I, and we call it Elphaba’s dance. It is probably the first time in her life where she is ever accepted by someone, or by a group of people. It is such a tender moment where everyone, including Glinda, have accepted her. C: It is also the first time Glinda decided to not care about what other people think, and just do the right thing! J: A very special moment. C: A turning point for both of them; where they both really connect for the first time. I also love watching “Defying Gravity”! Seeing Jacqueline every night, where I get this little spot at the side of the stage (the best view), I get so excited! She’s incredible. A final plug for the show? C: There are so many morals running through the show, and, obviously, it is amazing to be part of a production that is so empowering for women. Normally, the central story is about love between a male and female. 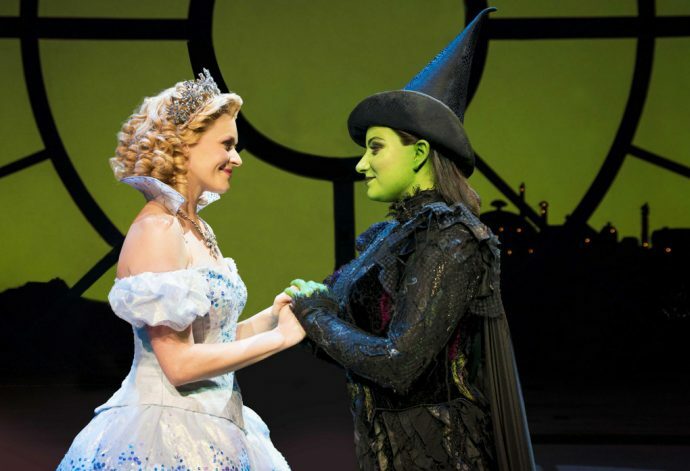 But, this story is about love and friendship between Elphaba and Glinda. It is rare and not many shows depict that. And, just one last fun question to end the interview. If you had magical powers like your characters, what would be the first thing you’d do? C: Teleportation! I’d love to be able to just click my fingers and be with my nieces, nephews, parents and my fiancé. J: I’d definitely take my broom. I can be anywhere, no need for a bus or plane. I just need an air-conditioning unit! I would like to thank Carly and Jacqueline for taking time out of their busy schedules for a quick chat with SUPERADRIANME.com. We wish them all the best in their Singapore leg of the tour, and can’t wait to check out the show for ourselves! Wicked will be playing at MasterCard Theatres at Marina Bay Sands from 29 September to 16 October 2016. Tickets are priced at S$55 (with additional booking fee of S$4/ticker) and is available at www.MarinaBaySands.com/ticketing or www.sistic.com.sg.